Blurb: A secret society exists among humans, comprised of immortals and gifted supernaturals. Kane is a Sensor, able to experience emotional energy through touch. Despite his good looks and easy-going personality, Kane lives a solitary life because unlike other Sensors, he is unnaturally hypersensitive. Touch brings pain. “CLOSER” is a 30,000 word novella. 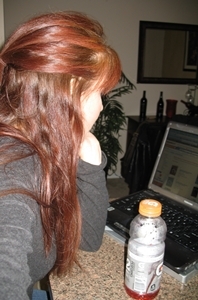 Down in Texas, there’s a woman who drinks copious amounts of vitamin water placed precariously close to her laptop. Yeah, I know. I’ve got a drinking problem. Hi, I’m Danni. When I’m not writing (which is all the time), I’m listening to obscure music, watching movies, reading, discovering new ways to humiliate myself bowling, and burning up my laptop battery on the internet. I live with a cat who thinks she is a dog, or a goat (she eats plastic, so I’m not sure which). Some people count sheep when they have insomnia. Since I was little, I used to make up stories in my head in a futile attempt to bore myself to sleep. The problem was, I’d get so wrapped up in my “head stories” that I would continue them through the following nights, changing it up each time to make it more exciting. Eventually, I started writing my ideas down more and more, creating short stories which evolved into poetry. Lots and lots of poetry. It’s almost embarrassing that I have an entire box loaded with spiral notebooks filled with furious, heartfelt, and blushing words. Apparently, I had a lot to say. I am finally doing what I have always wanted to: giving my characters a pulse through publishing. I write adult urban fantasy romance, but I don’t like labels. I let the story tell itself, and color outside the lines. I am not a YA author, but I think it’s pretty great that there are so many books available to teens in Urban Fantasy and Paranormal. These are the future readers! The work that goes behind self publishing is hard work, I won’t lie. On top of my regular day job: I write, edit, format, create cover art, and market. But it’s what I love to do, and someday, I’m going to be doing this full time.